A scrapbook of snapshots over the years, and perhaps some fun happenings in the future. I dedicated my second novel, Summer Moon, to my grandfather, who was very special to me! This is a picture of us. (I’m a bit younger here.) I was blessed to have him in my life for the time that I did. 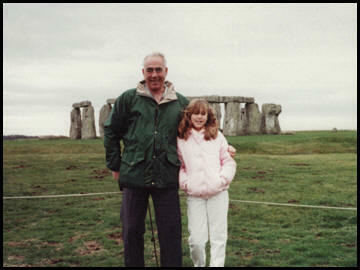 My grandmother is originally from Salisbury, just a short drive from Stonehenge, and she took this photo of my grandfather and me on a visit home. My dedication: In memory of J.S.P. Not a day goes by that you are not missed! My youngest son before he was over 6’6″ tall. I love this picture! 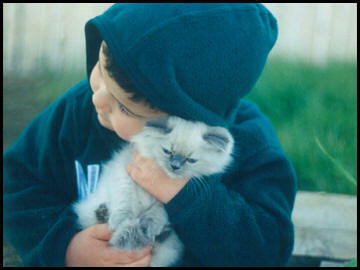 Maddy was one of our most ornery cats, as you can probably tell from her expression. This was taken almost fifteen years ago. I’m often asked how many novels it took to get published, and for me it took six–and many early mornings before my day job with a pot of coffee. I keep the rejected five manuscripts wrapped in caution tape by my desk. They will never be published!